The big news today is that Amazon has released a new cloud-based music service, Amazon Cloud Player. The service gives any Amazon customer a free 5GB Internet locker for storing music. Amazon provides a free uploader and both Web-based and Android clients. Files are securely stored on Amazon Simple Storage Service (Amazon S3). While the focus of Amazon’s announcement is on music, it’s actually pretty useless for storing and using your music. It’s free and pretty simple to use, but uploading 5 GB of music will take all day, for most users, because of the limitations of current broadband connections. The Uploader estimates that it would take over a week to upload my 70 GB library of music and podcasts. Most users interested in storing their music libraries online will immediately max out the 5 GB free space. And for what it costs to host a decent-sized music library online for a couple of years, you could buy an MP3 player. Because of these issues, Amazon’s Cloud Player is interesting as a proof of concept, but less useful than the technology it’s based upon, Amazon Cloud Drive. 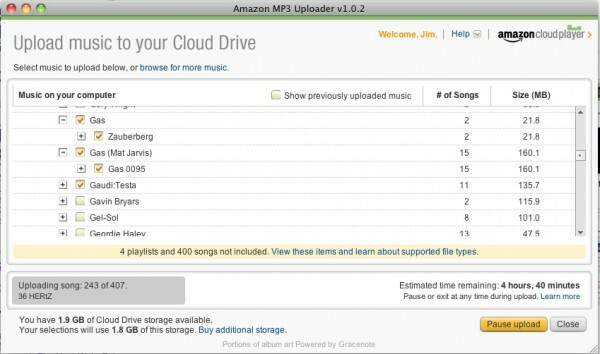 Think of Cloud Player as a trojan horse for Cloud Drive and Amazon’s service makes a lot more sense and could actually prove useful for podcasters. Cloud Drive lets you upload and manage more than music – pictures, videos and other documents. This makes it a useful free tool for backing up work in progress or for making your files available from anywhere you want in a secure manner. This will get really interesting if Amazon releases content apps for Cloud Drive that let you do things like record audio, video or photos and upload them directly to the cloud. If you’ve tried Cloud Player and Cloud Drive, let us know what you think. Is it useful for music? Are you going to use it as a free cloud-based storage locker? I can’t see why anyone wouldn’t try this out – since it’s 5GB of free Cloud storage. But, I also can’t see why anyone would pay $100 to store their music at Amazon, when everybody’s got MP3 players or smartphones. The upload speed is pretty terrible. I wonder if this is why Apple has held off on cloud storage. I can’t see this appealing to “normal” users at this point. Amazon is hardly breaking new ground here. Microsoft has had the skydrive available to anyone with a messenger account for a while now. Files can be easily shared from the skydrive thing too which allows easy collaboration for podcasters. Interesting story none-the-less. Not sure why people are so excited about anything with “cloud” in the name. I’ll get excited when I can mirror my hard drive to the cloud. It would probably take a month to do it with Amazon’s service. And hard drives are growing faster than bandwidth. This seems like it might be a good way to CYA with when creating media files while you’re traveling, but I’m not sure who’s really going to use this. Microsoft Skydrive gives you 25 GB for free.